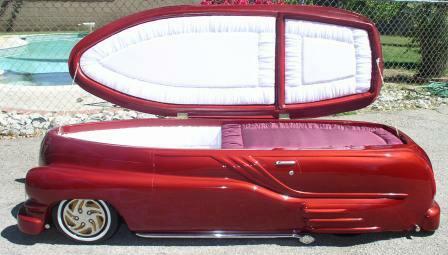 Why are you seeing the most badassest coffin ever? Because, now that I’ve gotten your attention, I’m going to tell you one of the worst jokes ever. A joke I heard over 25 years ago. It’s so bad, it’s good. I’ve always told people that I’m going to video tape myself telling this joke and have it played at my funeral for my hordes of grieving friends, fans and loved ones. Three strings walk into a bar~They sit down at a booth, and the first piece of string goes up to the bar to order some drinks. The first string goes back to the table with no drinks, so the second string gives it a go. The third piece of string stands up, ties himself into a knot and then starts unraveling his fringe at the top and bottom. His friends are confused and incredulous. He then confidently saunters up to the bar. “My friends and I would like some drinks, please.” He says to the bartender. Is there a stupid joke that just stays with you for some reason? Is it as bad as this one? Worse maybe? Let’s hear it. A hamburger walks into a bar, asks for a beer. Bartender says “I’m sorry, we don’t server food here”. Laughed my head off, and made it through the rest of the night. I usually tell the hamburger joke and the frayed knot joke as a pair. Ha ha! That’s too funny~ I may have found myself a new joke! A good, dumb, clean joke always stands the test of time. You’re right… that was terrible. and took in a boarder?” The old man winked and said, “Yep. Yes you should! Have a lovely afternoon yourself. The joke I fall back on is the one I told recently about too small underwear! Ha! That made me laugh. 🙂 Thanks. No! I refuse to hear a defense of that shelf. I shall meet you at dawn! Bring some chicken salad. A good chicken salad is really good, isn’t it? Yet so hard to find. So, is this a chicken salad throwdown? I’ll bring my close personal friend Bobby Flay, and we’ll see who’s the boss of chicken salad then, won’t we? « Darling! You simply MUST read my screenplay!